I am offering full card analysis from Saratoga Race Course each Saturday on my Today’s Racing Digest Handicapper page. For the July 27 program, I have posted a free play below, along with suggested Pick 6 tickets. I also posted my July 20 full card from Saratoga at the bottom. Check out my Saturday (July 27) Saratoga full card analysis (available now) at TodaysRacingDigest.com. For bonus free pick (SAR 11th race), click view sample. 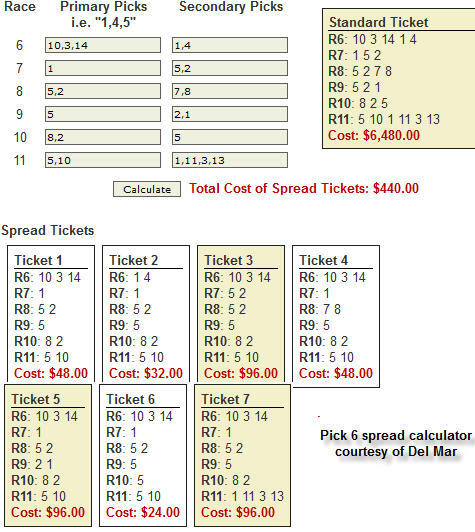 P6 spread tickets included with Saratoga analysis. Saratoga Race Course (Sat. July 27) – available now! The 2013 Del Mar thoroughbred season gets underway on Wednesday, July 17. In the video below, I look back at the 2012 leading riders, trainers, and the track profile. I also take a look at races and horses to watch for 2013.